Origin Confluence of Madison, Gallatin and Jefferson in Montana. 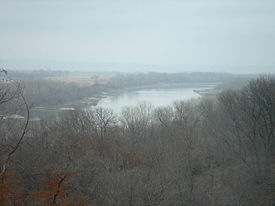 The Missouri River in the United States is the longest tributary of the Mississippi River. Lewis and Clark determined in 1805 that the Missouri begins at the confluence of the Madison, Jefferson, and Gallatin rivers in Montana. This determination is still widely accepted, though it was disproven by Jacob V. Brower in the mid-1890s. He discovered the true source to be Brower's Spring, at an approximate elevation of 8,800 feet in the Centennial Mountains. The Missouri flows into the Mississippi north of St. Louis, Missouri. When the Missouri meets the Mississippi they form the third longest river system in the world, after the Nile and Amazon Rivers. With the Lewis and Clark source data, the length is 2,341 miles, while Brower's source extends the length to 3745 miles. Its drainage basin occupies about 529,400 square miles (1,371,100 sq km) of the Great Plains, of which 2,550 square miles (16,840 sq km) are in Canada. It drains approximately one-sixth of the North American continent. The river is nicknamed "Big Muddy" and also "Dark River" because of the high silt content. The river meanders from bluff to bluff in the flat Midwestern states, leading to the nickname the "Wide Missouri." The headwaters of the Missouri are in the Rocky Mountains of southwestern Montana, near the Continental Divide, rising in the Jefferson, Madison, and Gallatin rivers. The longest headwaters stream, and thus the Missouri's hydrologic source, likely begins at Brower's Spring, which flows to the Jefferson by way of several other named streams. 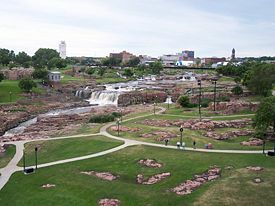 From the confluence of its main tributaries near the city of Three Forks, the Missouri flows north through mountainous canyons, emerging from the mountains near Great Falls, where a large cataract historically marked the navigable limit of the river. It flows east across the plains of Montana into North Dakota, then turns southeast, flowing into South Dakota, and along the north and eastern edge of Nebraska, forming part of its border with South Dakota and all of its border with Iowa, flowing past Sioux City and Omaha. It forms the entire boundary between Nebraska and Missouri, and part of the boundary between Missouri and Kansas. At Kansas City, it turns generally eastward, flowing across Missouri where it joins the Mississippi River just north of St. Louis. 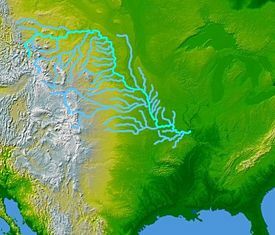 The extensive system of tributaries drain nearly all the semi-arid northern Great Plains of the United States. A very small portion of southern Alberta, Canada and south-western Saskatchewan is also drained by the river through its tributary, the Milk River. Another, separate area, in southern Saskatchewan is drained by another Missouri tributary, the Poplar River. The river's course roughly follows the edge of the glaciation during the last ice age. Most of the river's longer tributaries stretch away from this edge, with their origins towards the west, draining portions of the eastern Rockies. The Missouri in name officially begins at Missouri Headwaters State Park at an elevation of 4,045 feet in Montana at the confluence of the Jefferson River and Madison River. The Gallatin River joins the river just over half a mile downstream as it flows northeast. "Both Capt. C. and myself corresponded in opinion with respect to the impropriety of calling either of these [three] streams the Missouri and accordingly agreed to name them after the President of the United States and the Secretaries of the Treasury and State." 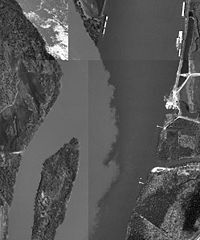 The Lewis and Clark decision not to call the Jefferson the Missouri has spurred debate over what is the longest river in North America since the Missouri and Mississippi are nearly identical in length. With the Jefferson included, the Missouri would be the longest river. "The most distant fountain of the waters of the mighty Missouri in search of which we have spent so many toilsome days and restless nights." In the mid-1890s Jacob V. Brower, Civil War veteran, surveyor, and historian, set out to verify the Missouri’s true source. Brower had discovered the Mississippi River's true source in 1888. He and a team of local ranchers climbed the Centennial Mountain Range searching for the source of the principal spring. The team discovered and recorded the source high in the mountains. 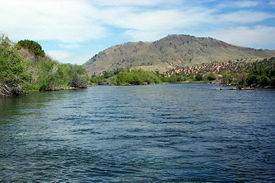 The source of the Missouri River, Brower's Spring, is at approximately 8,800 feet elevation in the Centennial Mountains. It is now commemorated by a rock pile at the source of Hellroaring Creek which flows into Red Rock River and then into Clark Canyon Reservoir where it joins the Beaverhead, then the Big Hole River, before ultimately connecting with the Jefferson. Taking its correct source into account, the length of the Missouri is 3,745 miles - third only to the Nile and Amazon Rivers. Edward "Ted" and Pat Jones-Confluence Point State Park in West Alton, Missouri, its north bank. High silt content makes the Missouri (left) noticeably lighter than the Mississippi here at their confluence north of St. Louis. The first Europeans to see the river were the French explorers Louis Jolliet and Jacques Marquette who shortly after looking at the Piasa petroglyph painting on the bluffs of Mississippi River above Alton, Illinois heard the Missouri rushing into the Mississippi. While conversing about these monsters sailing quietly in clear and calm water, we heard the noise of a rapid into which we were about to run. I never saw anything more terrific, a tangle of entire trees from the mouth of the Pekistanoui with such impetuosity that one could not attempt to cross it without great danger. The commotion was such that the water was made muddy by it and could not clear itself. Marquette wrote that natives had told him that it was just a six day canoe trip up the river (about 60 miles) where it would be possible to portage over to another river that would take people to California. However, Jolliet and Marquette never explored the Missouri beyond its mouth. The Missouri remained formally unexplored and uncharted until Étienne de Veniard, Sieur de Bourgmont wrote Exact Description of Louisiana, of Its Harbors, Lands and Rivers, and Names of the Indian Tribes That Occupy It, and the Commerce and Advantages to Be Derived Therefrom for the Establishment of a Colony in 1713 followed in 1714 by The Route to Be Taken to Ascend the Missouri River. In the two documents Bourgmont was the first to use the name "Missouri" to refer to the river, and he was to name many of the tributaries along the river based on the Native American tribes that lived on them. The names and locations were to be used by cartographer Guillaume Delisle to create the first reasonably accurate map of the river. Bourgmont himself was living with the Missouri tribe at its Brunswick village with his Native wife and son. He had been on the run from French authorities since 1706 when he deserted his post as commandant of Fort Detroit after he was criticized by Antoine Laumet de La Mothe, sieur de Cadillac for his handling of an attack by the Ottawa tribe in which a priest, a French sergeant and 30 Ottawans were killed. Bourgmont had further infuriated the French by illegally trapping, and for "immoral behavior" when he arrived at French outposts with his Native American wife. However after Bourgmont's two documents, Jean-Baptiste Le Moyne, Sieur de Bienville, founder of Louisiana, said that rather than arresting Bourgmont they should "decorate" him with the Cross of St. Louis and name him "commandant of the Missouri" to represent France on the entire river. Bourgmont's reputation was further enhanced when the Pawnee, who had been befriended by Bourgmont, massacred the Spanish Villasur expedition in 1720 near modern day Columbus, Nebraska which was to temporarily end Spanish designs on the Missouri River and clear the way for a New France empire stretching from Montreal, Canada to New Mexico. After squabbling with French authorities over financing of a new fort on the Missouri and also suffering a yearlong illness, Bourgmont established Fort Orleans which was the first fort and first longer term European settlement of any kind on the Missouri in late 1723 near his home at Brunswick. In 1724 Bourgmont led an expedition to enlist Comanche support in the fight against the Spanish. In 1725 Bourgmont brought the chiefs of the Missouri River tribes to Paris to witness the glory of France, including the palaces of Versailles, and Fountain bleau, and join a hunting expedition on a royal preserve with Louis XV. Bourgmont was raised to rank of nobility and remained in France. He did not accompany the chiefs back to the New World. Fort Orleans was either abandoned or its small contingent massacred by Native Americans in 1726. It is unclear how far up the Missouri Bourgmont traveled. He is the documented first European discoverer of the Platte River. In his writings he described the blonde-haired Mandans, so it is quite possible that he made it as far north as their villages in central North Dakota. The Spanish took over the Missouri River in the Treaty of Paris (1763) that ended the French and Indian War/Seven Years War. The Spanish claim to the Missouri was based on Hernando de Soto's "discovery" of the Mississippi River on May 8, 1541. The Spanish initially did not extensively explore the river and were to let French fur traders continue their activities, although under license. After the British began to exert influence on the Upper Missouri River via the Hudson Bay Company, news of the English incursions came following an expedition by Jacques D’Eglise in 1790. The Spanish chartered the "Company of Discoverers and Explorers of the Missouri" (popularly referred to as the "Missouri Company") and offered a reward for the first person to reach the Pacific Ocean via the Missouri. In 1794 and 1795 expeditions led by Jean Baptiste Truteau and Antoine Simon Lecuyer de la Jonchšre failed to reach as far north as the Mandan villages in central North Dakota. The most significant expedition was the MacKay and Evans Expedition of 1795-1797. James MacKay and John Evans, both explorers, were hired by the Spanish to tell the British to leave the upper Missouri and to search a route to the Pacific Ocean. McKay and Evans established a winter camp in Nebraska, about 20 miles south of Sioux City, Iowa, where they built Fort Columbus. Evans went on to the Mandan village where he expelled British traders. With the help of local Indian tribes they observed the Yellowstone River (which they called "Yellow Rock"). Most substantially, they were successful in creating a detailed map of the upper Missouri that was to be used by Lewis and Clark. On October 27, 1795, the United States and Spain signed Pinckney's Treaty, giving American merchants the "right of deposit" in New Orleans, meaning they could use the port to store goods for export. The treaty also recognized American rights to navigate the entire Mississippi River. In 1798 Spain revoked the treaty. On October 1, 1800, the Spanish secretly returned Louisiana to the French under Napoleon in the Third Treaty of San Ildefonso. The transfer was so secret that the Spanish continued to administer the territory. In 1801 rights were restored to the U.S. use the river as well as New Orleans. Thomas Jefferson, fearing the cutoffs could re-occur, sought to negotiate with France to buy New Orleans for the asking price of $10 million. Napoleon made a counter offer of $15 million for all of the Louisiana Territory including the Missouri River. The agreement was signed on May 2, 1803. On June 20, 1803, Jefferson instructed Meriwether Lewis to explore the Missouri and look for a water route to the Pacific Ocean. Spain contested America's acquiring of Louisiana Territory, claiming France had never formally claimed it. Spain formally forbade Lewis to take the journey, expressly forbidding his access of the McKay and Evans map, the most detailed and accurate of its time. Lewis gained access to it surreptitiously. To avoid jurisdictional issues with Spain, they wintered in 1803-1804 at Camp Dubois on the Illinois side of the Mississippi River. Lewis and Clark departed on May 14, 1804 and returned to St. Louis on September 23, 1806. The River defined the American frontier in the nineteenth century, particularly upstream from Kansas City, where it takes a sharp eastern turn into the heart of the state of Missouri. All of the major trails for the opening of the American West have their starting points on the river, including the California, Mormon, Oregon, and Santa Fe trails. The first westward leg of the Pony Express was a ferry ride across the Missouri at St. Joseph, Missouri. The first westward leg of the First Transcontinental Railroad was a ferry ride across the Missouri between Council Bluffs, Iowa and Omaha, Nebraska. The Hannibal Bridge was the first bridge to cross the river when it opened in Kansas City in 1869, and was a major reason for Kansas City becoming the largest city on the river upstream from its mouth at St. Louis. Extensive use of paddle steamers on the upper river helped facilitate European settlement of the Dakotas and Montana. The Department of the Missouri, which was headquartered on the banks of the river at Fort Leavenworth, Kansas, was the military command center for the Indian Wars in the region. 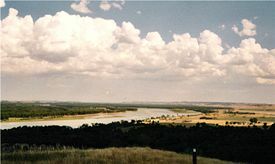 The northernmost navigable point on the Missouri before extensive navigation improvements was Fort Benton, Montana, at approximately 2,620 feet. 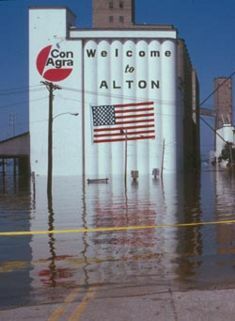 The Great Flood of 1993 was a major flood that occurred in the Midwest, along the Mississippi and Missouri Rivers, and their tributaries, from April to October of 1993. The flood was among the most costly and devastating to have occurred in the United States to that time, with $15 billion in damages. The area of flood approximated 745 miles in length, and 434 miles in width, making a total flood area of about 521,951 square miles. It was the worst U.S. natural disaster since the Great Mississippi Flood of 1927, as measured by duration, square miles inundated, persons displaced, crop and property damage, and number of record river levels. In some categories it surpassed the 1927 flood. French Bottoms at St. Joseph, Missouri which placed a piece of Missouri on the west of the River obliging Missouri residents to go through Kansas in order to reach Rosecrans Airport. Gavins Point on the South Dakota-Nebraska border. 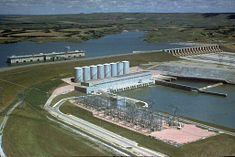 These dams were constructed without locks, so commercial navigation on the Missouri cannot proceed above the Gavins Point Dam. The Corps of Engineers maintains a 9-foot deep navigation channel for 735 miles between Sioux City, Iowa and St. Louis in non-winter months. The dams aid navigation on the lower river by reducing fluctuations in water levels. Thirty-five percent of the Missouri River is impounded, 32 percent has been channelized, and 33 percent is un-channelized. 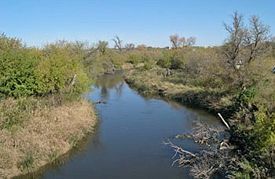 The only significant stretch of free-flowing stream on the lower Missouri is the Missouri National Recreational River section between Gavins Point Dam and Ponca State Park, Nebraska. This federally-designated "Wild and Scenic River" is among the last unspoiled stretches of the Missouri, and exhibits the islands, bars, chutes and snags that once characterized the "Mighty Mo". The huge amounts of sediment in the Big Muddy create a constant need to dredge behind the dams as well as on the navigation streams. Dredging has resulted in 7.4 million tons of sand and debris being dredge out of the navigation channel of the river each year. Barge traffic has been steadily declining from 3.3 million tons in 1977 to 1.3 million tons in 2000. The declining barge traffic industry has stirred controversies over the management of the river and whether upstream dams should release the water to maintain the commercial navigation standards. The States of Iowa and Missouri have sought to revive their waterfronts by permitting riverboat gambling. The initial gambling regulations required the casinos to navigate the river. They were subsequently amended so that the casinos could be permanent land based structures as long as they had a moat with Missouri River water surrounding them. The following rivers are listed going downstream based on the states where they enter the Missouri. Across the Wide Missouri is a 1947 historical work written by Bernard DeVoto. It is the second volume of a trilogy that includes The Year of Decision (1942) and The Course of Empire (1952). It is a history of the Fur trade in the American West during the 1830s, a time when it was at its peak. The trapping of beaver and other animals caused conflict between the trappers and the various Indian tribes of the Upper Missouri River Basin. In 1951, a film by the same name was produced, based upon the novel. The film dramatizes an account of several fur traders and their interaction with the Native Americans. The film was directed by William A. Wellman and starred Clark Gable as Flint Mitchell, Ricardo Montalban as Blackfoot Iron Shirt, John Hodiak as Brecan, J. Carrol Naish as Nez Perce Looking Glass, and Adolphe Menjou as Pierre. Howard Keel, as Mitchell's son, narrates. George Caleb Bingham "Fur Traders on Missouri River," c. 1845. The American painter George Catlin traveled up the Missouri in the 1830s, making portraits of individuals and tribes of Native Americans. 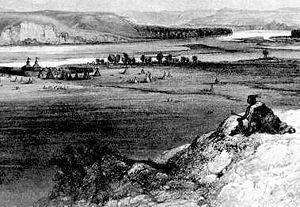 He also painted several Missouri River landscapes, notably Floyd's Bluff and Brick Kilns, both from 1832. The Swiss painter Karl Bodmer accompanied German explorer Prince Maximilian zu Wied-Neuwied from 1832 through 1834 on his Missouri River expedition. Bodmer was hired as an artist by Maximilian for the purpose of recording images of the Native American tribes that they encountered in the American West. In 1843, the American painter and naturalist John James Audubon traveled west to the upper Missouri River and the Dakota Territory to do fieldwork for his final major opus, Viviparous Quadrupeds of North America. A typical example from this folio is American Bison. 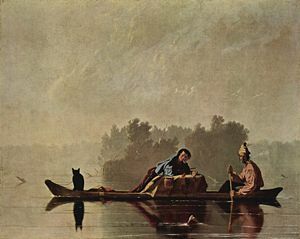 Missouri painter George Caleb Bingham immortalized the fur traders and flatboatmen who plied the Missouri River in the early 1800s; these same boatmen were known for their river chanties, including the hauntingly sentimental American folk song "Oh Shenandoah." Each verse of "Oh Shenandoah" ends with the line, "…'cross the wide Missouri." The river is notable for being the setting of the Pete Seeger song Waist Deep in the Big Muddy. (There is some ambiguity as to location. Seeger also sings that the action took place in "Loo-siana".) The song is set in 1942, during training for World War II, but its image of a foolish captain who pushes his men further and further into a hopeless situation was clearly meant to parallel the Vietnam War. In the song, a captain leading a squad on training maneuvers insists on crossing the titular river, insisting that it is safe to cross. The captain sinks into the mud, drowns, and his squad turns back. As they are heading back, they are taken by the beauty of the river and stay. ↑ Gaylord Nelson Institute for Environmental Studies.Sage Database for Great Falls Retrieved December 15, 2007. ↑ Gaylord Nelson Institute for Environmental Studies. Sage database for Pierre, SD Retrieved December 15, 2007. ↑ Robert E. Criss, 2002 Rising Flood Stages on the Lower Missouri River Washington University - St. Louis. Retrieved December 15, 2007. ↑ Donald F. Nell and Anthony Demetriades. July-August 2005.The True Utmost Reaches of the Missouri Montana Outdoors. Retrieved December 15, 2007. This page was last modified on 11 November 2014, at 00:34.